Shawl for kids available in new colors! Knit Factory's home accessories are surprisingly different and yet shockingly normal at the same time. 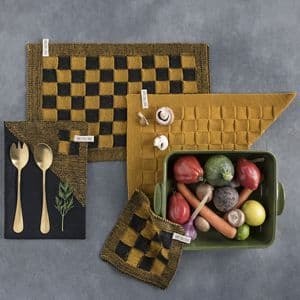 No matter how unique all the bed textiles, bath textiles, kitchen textiles, and the knitted home decoration may be, the remarkable home interior accessories have a few things in common. Take for instance their indestructible quality. And the natural colours, Dutch roots, and down-to-earth appeal. Design and luxury go hand in hand with cosiness and functionality. That is what we aim for. We proudly present Luna, the latest Knit Factory fashion items. The assortment consists of long knitted ladies cardigans and large scarves, which can be worn in different ways. With Luna you will be dressed stylishly all year round. Whether it’s a cold winter or autumn day or even a cool summer evening. Luna will keep you nicely warm. With a collection of 16 different colours, there’s an option for everyone. Liv is a pareo, as well as a beach blanket and hammam towel. A wrap dress, shawl, and at the same time a skirt. 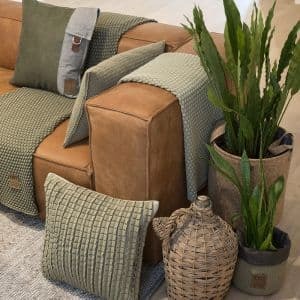 Two brand-new cushions in Knit Factory`s collection. 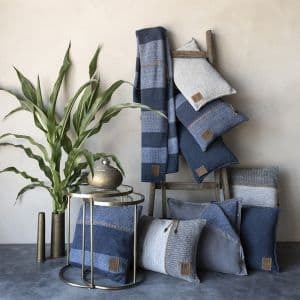 Take a look at our catalogue and brochure featuring our knitted home accessories, fashion items, and the latest kitchen textiles, bed textiles and bath textiles. There is always a point of purchase nearby.